$ 25.00 - "SOLD" - THANK YOU !! Limited edition 1996 ELVIS Carlton Cards Ornament. This Second in a Collectible series Elvis ornament is musical and plays " SANTA BRING MY BABY BACK, ( TO ME )." This ornament was never used and comes in its original box with original battery. Not sure if the battery needs to be replace due to being over 13 years old. 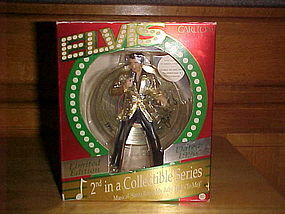 The Elvis ornament is in Excellent condition and the original box is in very good condition. This would make a great gift for Elvis and 1950's Rock N Roll fans!!! $ 18.00 - SOLD - THANK YOU !! 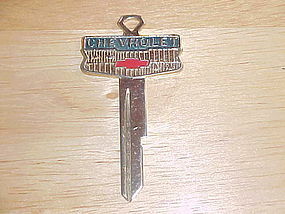 Classic Chevy bowtie gold plated key blank. This key blank was made as a custom after market item. This key blank can be cut for actual use and it will fit Chevy model year cars 1967, 1971, 1975,1979, 1983, and 1989 that have L groove keys. This Chevy key blank would make a great gift for a Classic Chevy Owner!!! 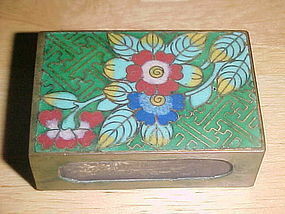 1920's - 30's Chinese Cloisonne match box holder. This vintage hand made piece has a floral design with a green background. It measures 2 1/4" long and 1 1/4" wide. There is some minor pitting due to many years of use, but in very good condition and Beautiful!!! $ 25.00 - SOLD - Thank You!! Nice vintage Advertising Bolo for International Harvester farm equipment. I believe this is a pre 1970's item. 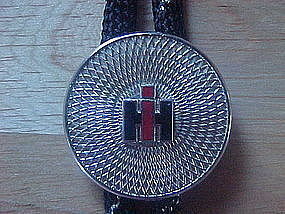 The bolo features a silver toned crosshatched pattern disc with a raised enamel iH ( the symbol for International Harvester ). The disc is 1 1/8 in diameter and this bolo is in extra fine condition!!! SOLD - THANK YOU !! 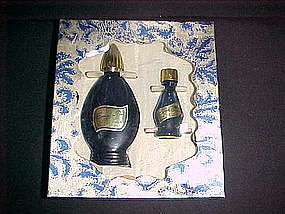 Fabulous vintage 1950's ladies fashion purse cigarette lighter with original box. This beauty looks like a fancy lipstick case. The cap is crowned with a large faceted pink rhinestone surrounded by smaller white diamond rhinestones!!! 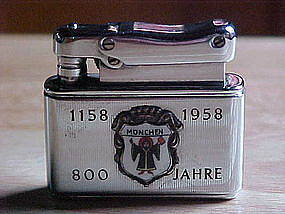 This lighter is in extremely fine condition and measures 3 7/8" high. Super cigarette advertising piece from 1930's!!! 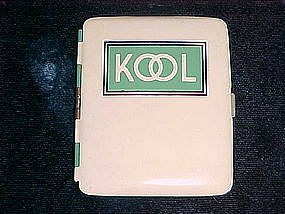 This is a cigarette case that advertises KOOL cigarettes. 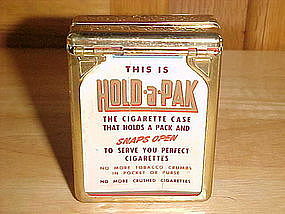 This case is in fine condition and measures 3 1/4" high x 2 5/8" wide. 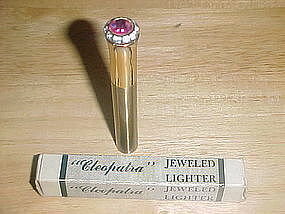 Interesting vintage 1960's Mens Novelty tie clip. This is a combination tie clip and mechanical pencil that was made in Japan. 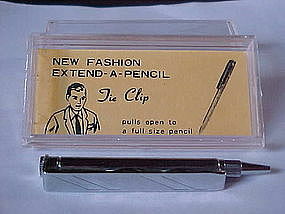 The pencil can be pulled open to be full sized. It is in MINT condition and comes with its original box. 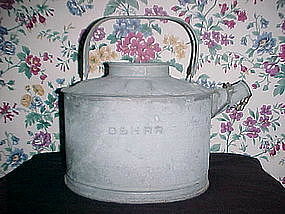 Vintage Railroad Oil can in Very fine condition. This Oil can is circa 1920's to 1940's. It is signed " D & H RR ". It measures 12" in height from handle to base and about 13" long. 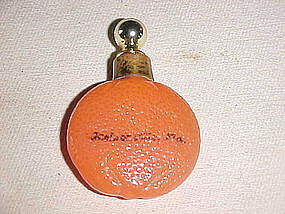 It is missing it's cover but maintains it's original spout cap that is attached by chain. A wonderful piece of Railroad Memorabilia!!! $ 110.00 - SOLD, Thank you. 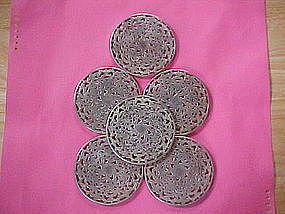 Beautiful set of six (6) vintage sterling silver covered crystal coasters. These are circa 1900 to 1920 and are signed WEBSTER STERLING and the company mark W over a C with an arrow across the letters. They are in fine condition and each measures 3" in diameter. The design is a continuous floral pattern with the flowers I believe to be Orchids. SOLD - THANK YOU !!! 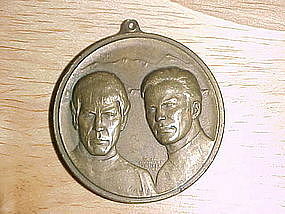 Very desirable solid bronze medallion/medal made to commemorate Star Treks 10th Anniversary. This limited edition medal is individually numbered on side and is in very fine condition. It is approximately 1 1/2" in diameter. $ 50.00 - SOLD - THANK YOU !!!! 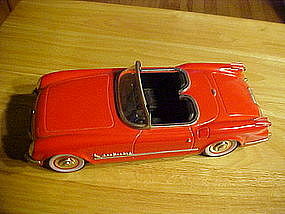 Mint in box 1953 Corvette convertible friction tin car. This car was made in Japan in the 1980's. The bottom is stamp in " 50's, FIFTIES, Made in Japan." This car measures 9 1/2" in length and is heavy in weight. 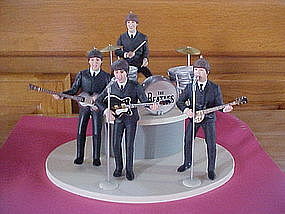 A Beautiful scale Model!!! $ 40.00 "SOLD" - THANK YOU! 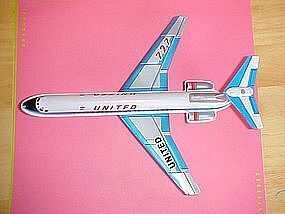 A 1960's litho tin United Airlines airplane made in Japan. It is a Boeing 727 with friction motor driven wheels.This toy airplane is 10 1/2" long. It has never been played with and comes in it's original store packaging with a cardboard hanger featuring a comic image of a boy decked out in a 1960's mod psychedelic outfit. 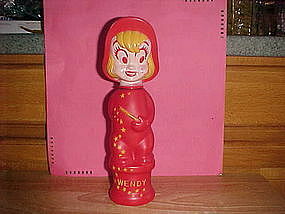 This toy is in excellent condition with just a few minor factory storage bin scratches.